This Trail Guide is Under Construction! On the Southeast side (lower Right) of this map you can continue South on the Tahoe to Yosemite Trail towards Saint Marys Pass, or track Northeast up the Highland Creek Trail to rejoin the Pacific Crest Trail at Wolf Pass to hike South towards Sonora Pass or North to Ebbetts Pass. The USGS Topo Maps above are inaccurate. Spicer Meadow Reservoir extends Northeast, covering Gabbot Meadow and extending to the three trail junctions where the trails to Bull Run Creek, Bull Run Peak and Pacific Valley split off from the Tahoe to Yosemite Trail pictured on the far Left, or Eastern side of the map above. The trail across Gabbot Meadow is underwater. Click the red dots on the maps above to see the trail configuration as of October 2011, when the trails depicted above were modified into the new configuration of a single trail junction to the North from the upper end of Spicer Meadow Reservoir. This small section of topo map of the present configuration of Spicer Meadow Reservoir above is from the National Forest Service 1987 Carson-Iceberg Wilderness Map. It depicts the old trail junction configuration. 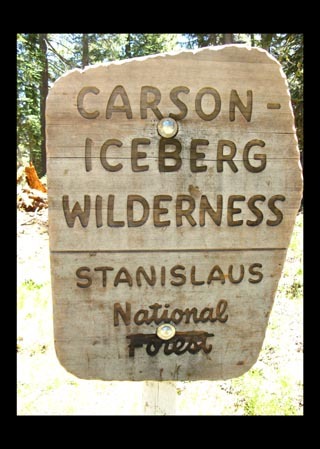 2000 Carson Iceberg Wilderness (pdf). The map above represents the current configuration of the trail junctions and reservoir. Those squares breaking the USGS topo maps up into a grid are the Universal Transverse Mercator / Military Grid Reference System, otherwise commonly known as UTM. From my point of view that is 1000 yards or .62 of a mile. The map above is set up to show access to the Lake Alpine and Ebbetts Pass trailheads on Highway 4. We can also adjust the road map a bit to the South to find where the paved Spicer Meadow Road breaks off the South side of Highway Four to the West of Bear Valley to access the Tahoe to Yosemite Trail. The paved Spicer Meadow Road leads to a web of improved Forest Service Roads servicing Union Spicer Meadow Reservoirs. Forest Service Road 7N01 offers the closest hiking access to the Tahoe to Yosemite Route at its end at Elephant Rock Lake. I guess that this would be a good place to begin and end a backpacking loop. But, I think Highland Lake is a better place to begin remote loops. Highland Lakes is situated between the TYT and PCT, rather than being offset from the TYT as is the Elephant Rock Lake access point. The Highland Lake Road is a bit West of Ebbetts Pass. Which is best for you depends on what you want to see. The best trip for different folks are different. The Elephant Rock Lake entry point is perfect to access a short but sweet backpacking trip to Rock Lake, then around to Duck Lake, then back down the mountain to Elephant Rock Lake. That is a beautiful piece of country with three beautiful lakes in close proximity on a nice litttle loop. Hiking South from the East Shore of Lake Alpine through the Silver Trailhead we are entering the Carson-Iceberg Wilderness on the Tahoe to Yosemite Trail. The Duck Lake Loop junction sits about a half-mile past the trailhead before you reach Duck Lake on the main trail. This junction determines which side of Duck Lake the Southbound hikers will pass. I prefer taking a right here to hike the route around the Western side of Duck Lake. This route offers more expansive views of the lake than from the Eastern way around. But there are nice campsites on the Eastern side of the lake, so if those sites are your destination you would want to take a Left here to hike around the East side of the lake to your campsite. Heading straight, (veering Right) through the junction and hiking a little over a mile beyon the Silver Valley Trail head (1.1 miles) we run into the second Duck Lake loop trail junction on the West side of Duck Lake. A rustic old ranch house and Duck Lake mark this junction. Take a left to continue South on the Tahoe to Yosemite Trail. Hiking straight through this trail junction, off the Tahoe to Yosemite Trail, brings you into a stunningly beautiful mixture of remote grantie and forest down to Elephant Rock and Elephant Rock Lake. Hiking up to the Tahoe to Yosemite at Rock Lake or via Summit Lake sets you up for your return hike back to Silver Valley on a nice little backpacking loop. Hey, if you are going to do a loop around Duck Lake you should check out your options for a bigger Loop. Personally, I hike the trail down to the Duck Lake trail junction on the West side of Duck Lake, taking a right at the first Duck Lake trail junction. I like the view of Duck Lake from this side of the loop. Hiking Left from the first Duck Lake trail junction out of Silver Valley is almost bypassing Duck Lake, as you will not get many views of the lake as you hike South. What you see on your map depends on what map you are holding. Every map seems to be missing one trail or another. Neither the Duck Lake Loop, nor the Rock Lake Trail down to Elephant Rock appear on the USGS 30 minute Federal maps, while the Summit Lake trail is missing from the 7.5 minute maps. These trails and junctions are depicted on the National Forest Map of the Carson-Iceberg Wilderness, pictured above. 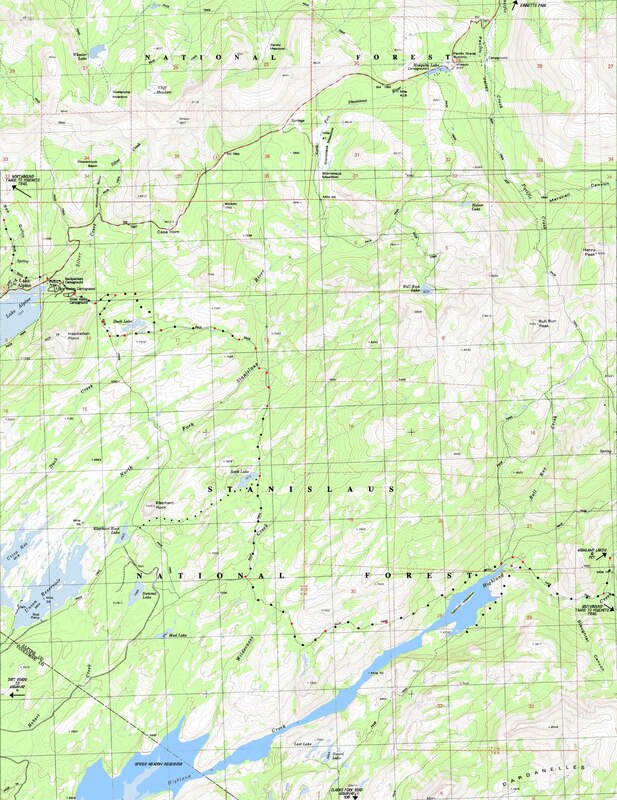 The National Forest Topo Map depicts the Duck Lake Loop, and the Rock Lake Trail. But note how I put the red dot for the trail junction on the South side of Rock Lake, rather than their Northern location on the NF map. The trail is currently located on the South side of the lake as of 2012. 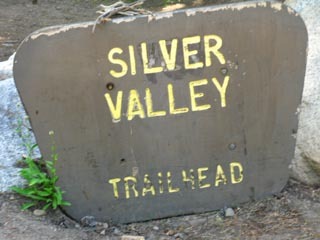 In any case, we are following the Silver Trail, the Highland Creek Trail, and the Tahoe to Yosemite Trail South through this section between Lake Alpine and Saint Marys Pass. 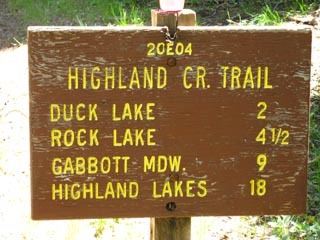 If we continued straight through the Duck Lake junction by the wrecked ranch house rather than hiking towards Rock Lake and Spicer Meadow Reservior this delightful trail brings us down and South to the road access at Union Reservoir through an intriguing faint trail of mixed granite and forest. Real pretty terrain out here. During an excursion down this trail in early July of 2009 I checked out the trail ducking laid down on this faint route by a team of expert Boy Scout High Sierra Backpackers. The lads pictured below properly ducked this faint trail. Good work, dudes. These Scouts were the elite dudes from a High Sierra Boy Scout Backpacking Camp who bring elements from various troops visiting their camp out on High Sierra backpacking trips. The team pictured below was checking out the trails where they would lead backpacking trips of less-experienced and younger Scouts into the High Sierras. I met the boys when I was hiking Southbound from Lake Alpine on a Tahoe to Whitney trip, and they had just exited the Silver Valley Trailhead Northbound and were heading back to their Wolfsborough base camp. There's a big Scout Camp there, apparently. They had just finished hiking and ducking the trail between Union Reservior up to the Duck Lake junction. This Boy Scout team did not over-duck the faint parts of the trail, a common problem with rookie hikers, but instead laid out a fine series of subtle ducks that marked the route without detracting from the experience. You can find their ducks on this faint trail, but you had to look for them. Good work, Boys! Alex, Nick, Colton, and Aric were fine examples of the best things Boy Scouts offers kids: using wilderness experiences to build good people. 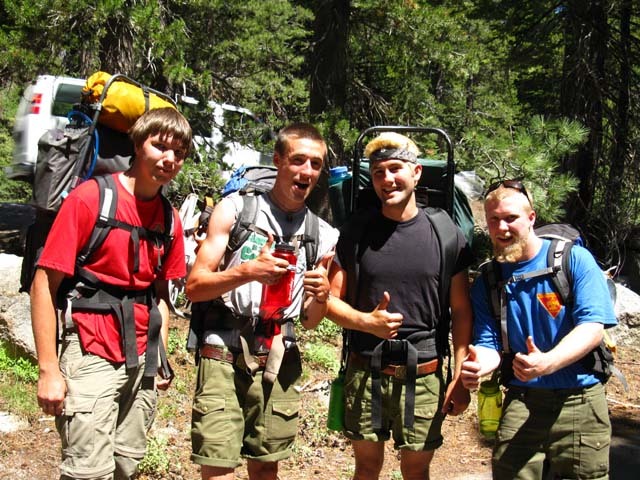 Nick, Colton, and Aric were throughly hardened veteran High Sierra Backpackers. Alex was being worked, I mean worked into this status. All were taking the load well, as the picture below shows, though Alex had a hard time mustering a thumbs-up, let along a full smile, as were his senior scouts. Senior Scouts move fast and work hard. And the temps were astronomical for the altitude. It was hitting the low '90s well before Noon. My trail notes indicate that their group was called the Wolfsborough Treckers, and I believe they were all Eagle Scouts or working towards that goal. Fine young men. Excellent Boy Scouts: Alex, Nick, Colton, Aric. Note their gear: Two Old School, two ultralight..., the Boy Scouts do it all! The Union Reservoir offers excellent access to the lightly-used trails leading to Spicer Reservoir, Highland Creek and Lakes, and the Clarks Fork of the Stanislaus via the Tahoe to Yosemite Trail route. Many fine routes of various lengths can be crafted to explore this region of the Carson-Iceberg Wilderness. Access is through the Spicer Meadow Reservoir Road located one mile West of the tiny town of Tamarack and 6.5 miles West of Lake Alpine on Highway 4. Check out the roadmap on the Lake Alpine Topo Map page. Approaching Spicer Meadow Reservoir accesses the trails up the South side of Bull Run Peak via Bull Run Creek to pass North between Bull Run and Henry Peaks to Pacific Valley on Highway 4. Note that the trail junction configuration up Bull Run Creek at the end of Spicer Meadow Reservoir has changed. The two trail junctions along the Northeast end of Spicer Meadow Reservoir have been consolidated into the existing junction at the far end of the reservoir. We also have another route option to Pacific Valley. Hiking up Highland Creek past the TYT's turn up Jenkins Canyon brings us to the Weiser Creek trail junction. From here we can hike up to Pacific Valley on Highway 4 between Lookout and Henry Peaks. This loop from Pacific Valley back to Pacific Valley via Spicer Meadow Reservoir is into especially quiet trails and terrain. Though my favorite views of Spicer Meadow Reservoir are from the trails, I found this view of the terrain from the surface of Spicer Meadow Reservoir. Boating to the trail junctions and campsites at the end of Spicer Meadow Reservoir is an access option for fishermen with backpacking gear, but beyond the scope of this guide. The Tahoe to Yosemite route follows the Highland Creek and Tahoe to Yosemite Trail routes around the Eastern end of Spicer Meadow Reservoir hiking South from Highway 4 out of the Silver Valley Trailhead. Neither the 7.5 nor the 30 minute USGS depict the current extent of Spicer Meadow Reservoir. Just East of the Spicer Meadow Reservoir we will either continue hiking up the Highland Creek Trail Northeast up to and past Highland Lakes to the Pacific Crest Trail at Wolf Creek Pass, or we will bend to the Southeast through the Tahoe to Yosemite Trail junction at Jenkins Canyon to hike over to Arnot Creek and then up along the Clarks Fork of the Stanislaus. Myself, I prefer the former route. The map series follows both routes along with associated miles and trail guide pages. Check out both routes as parts of long trips or as elements in some nice backpacking loops through the Carson Iceberg. If we follow the Tahoe to Yosemite Trail we will track the Clarks Fork of the Stainislaus River up to Saint Marys Pass. If we decide to rejoin the Pacific Crest Trail at Wolf Creek Pass (Southbound backpackers on the Tahoe to Yosemite Trail first split off from the Pacific Crest Trail at the Carson Gap) we will soon encounter and trace the route of the East Fork of the Carson River up and through its back to back headwater bowls with Wolf Creek Lake on our way over the Sonora Gap to Sonora Pass. Sonora Pass is a mile East of Saint Marys Pass on Highway 108. Despite the quite divergent routes the Tahoe to Yosemite and Pacific Crest Trails follow South of Carson Pass they come quite close to each other on Highway 108. From Highway 108 the PCT and TYT again trace out very different routes. The PCT continues South along the Sierra Crestline from Sonora Pass while the TYT hiker drops down to Kennedy Meadows to once again hike up the Western Flank of the Sierra to the Crest. Options like this are why you want to hike the Tahoe to Whitney trails many times. Any way you go you will miss something really beautiful on the other trail. From Sonora Pass the Southbound hiker on the Tahoe to Yosemite Trail has put one extra mile between themselves and the continuation of their Southbound TYT route out of Kennedy Meadows. As smart backpackers hitch-hike the 9 miles West down Highway 108 to Kennedy Meadows Pack Station this extra mile is irrelevant. I strongly suggest that you do not plan on hiking up or down Highway 108 between Kennedy Meadows Pack Station and Sonora Pass. This section of road is very narrow, twisting, and laid out over some precipitious terrain. Nice locals will stop and offer you a ride if they see you hiking it, more to save you from getting run over by tourists and the car campers and therefore blocking their road, than anything else. USDA Forest Service, Carson-Iceberg Wilderness. Stanislaus and Toiyabe National Forest, California and Nevada. 1987. That is the map with Spicer Meadow Reservoir included, rather than my crude addition of the reservoir's shoreline. Between Highway 4 and Highway 108 on the Western Flank of the High Sierra. Trail Guide, Section Index: Highway 4 to 108. Trail Guide page : Rock Lake to Jenkins Canyon. Map Index: TYT Highway 4 to 108.